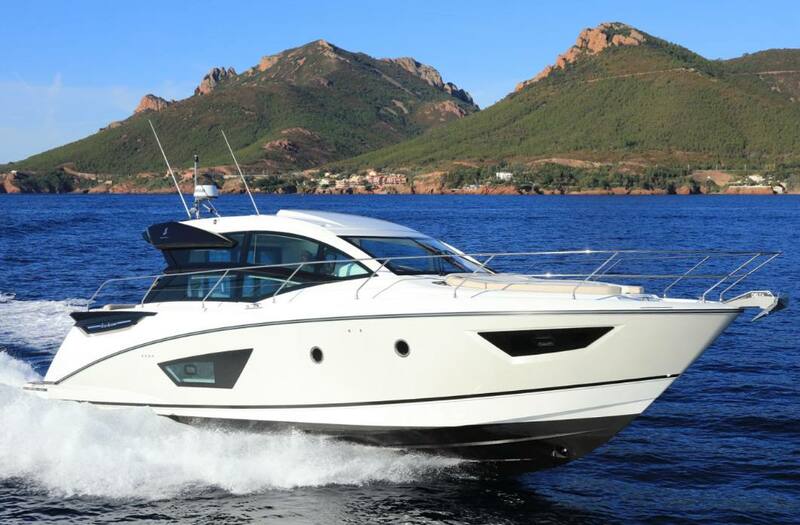 As the flagship of the latest generation of sport cruisers by Beneteau, the Gran Turismo 50 stands apart. Her elegant profile, full-space main deck, and onboard technology will win over connoisseurs of beautiful objects and thrill-seekers alike. Exterior design: The Gran Turismo 50 is sporty and elegant, marrying driving sensations and lifestyle on board. 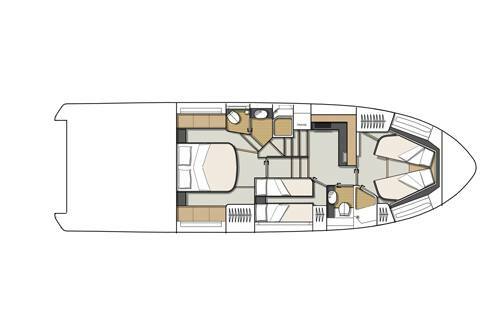 Beneteau has shaken up the world of sport cruisers with this largest model of the range featuring a planing hull, Volvo IPS 600 engine power, an in-built retractable sun visor in the Hardtop and modular side glazing. The cockpit continues in the form of a vast protected lounge on the full-space main deck. This fully-flush layout seamlessly connects the interior with the exterior. 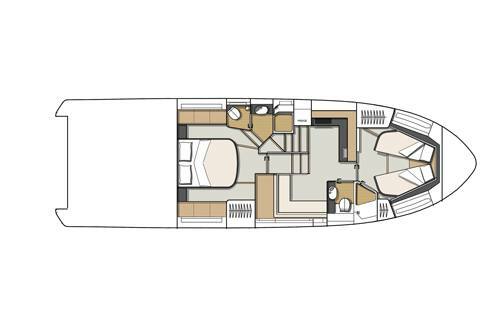 Ideally situated and perfectly protected by the cap of the hardtop, the on-deck galley can by enhanced with an aft worktop and grill. The tender garage, which is compatible with the Williams Minijiet 270, is reached by the huge submersible swim platform. They are ideal for the enjoyment of a wide range of water sports. 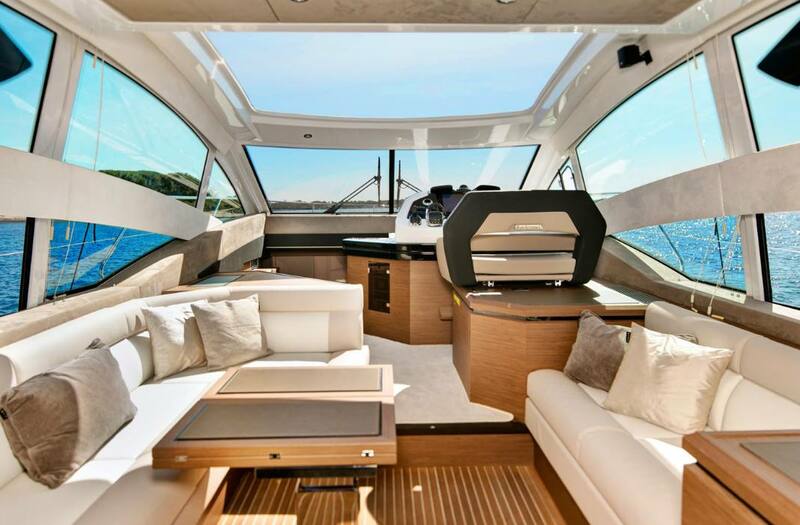 Interior design: The interior is refined, spacious and extremely comfortable, with a large number of windows and portholes that fill the lower deck spaces with light. 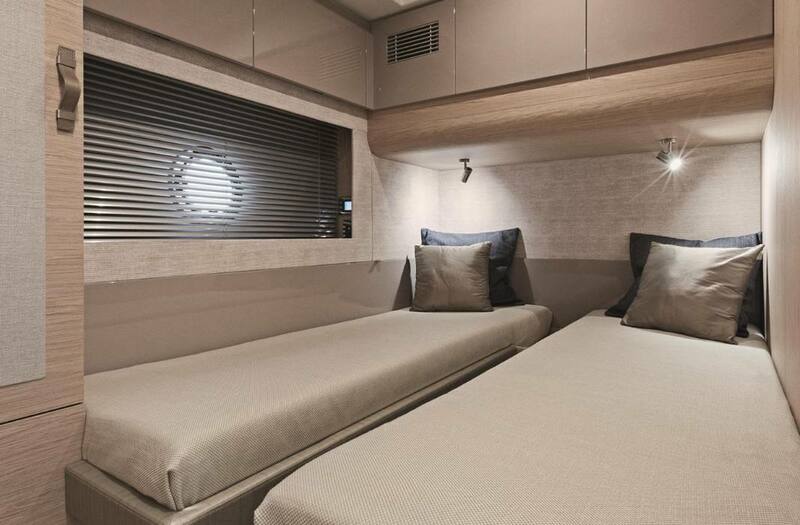 Reached by a portside companionway, the main galley combines design and practicality with a magic corner, lots of storage, refrigerator and freezer, and Corian® worktops.The two versions of the Gran Turismo 50 – “saloon cosy” or three cabins – have a full-beam owner suite, bathed in light and enjoying an en-suite shower room, as well as dressing room-style fittings. 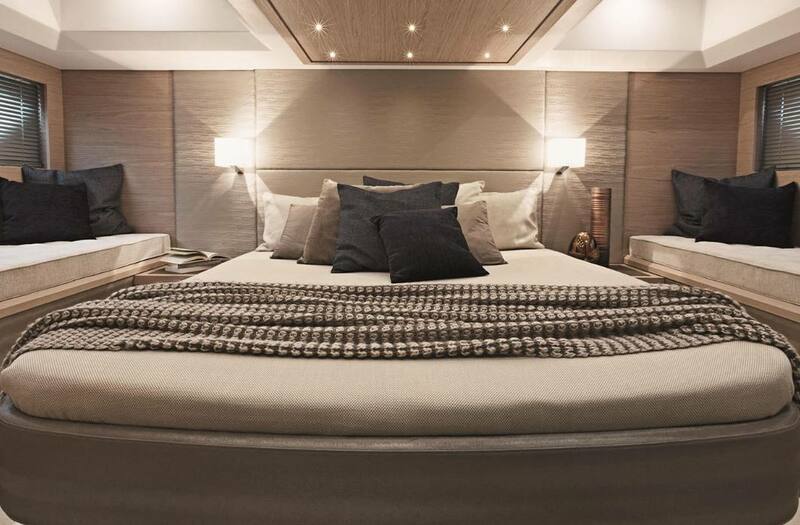 The quality and combination of materials, the deep pore walnut woodwork as well as lots of decorative details are the hallmark of a luxury boat. Larger Than Life Sensations: Enjoy the sheer pleasure of the Gran Turismo's controls, driving, sensations, comfort, and generous space. 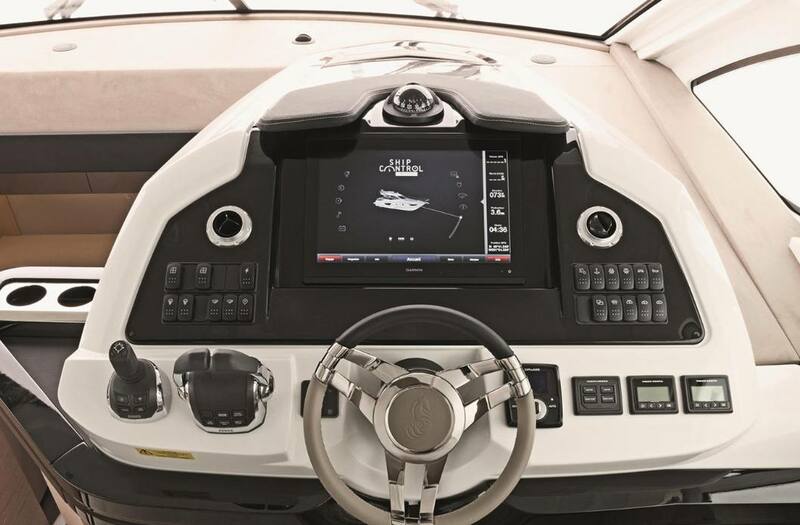 Ship Control: Check the gauges, manage the air-conditioning, navigation lights, lighting, and hi-fi system from the driving console or a wi-fi connected tablet: a quick tap or slide of the cursor and the Gran Turismo 50 obeys your every command." 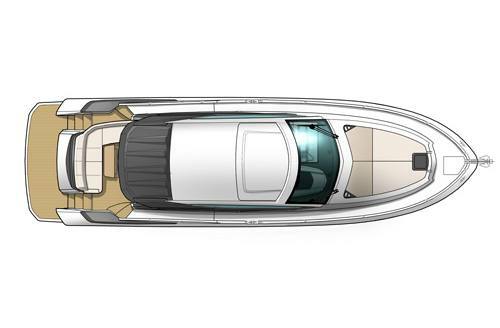 Air Step® Hull And IPS: Closely developed with Volvo, the engine manufacturer, the Gran Turismo 50 features an Airstep® 2 planing hull that boasts speed, safety and a comfortable drive. 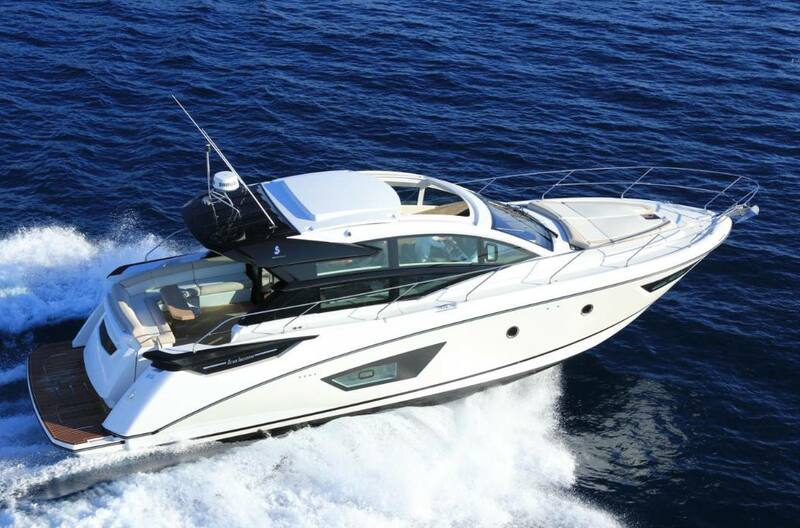 Combined with IPS technology she offers optimum fuel consumption and outstanding sea-keeping. Tender Garage: The tender garage at the stern, compatible with the Williams Minijet 280, holds any standard outboard tender up to 2.90 m and opens onto a huge submersible swim platform. Withstanding up to 350 kg, this platform is ideal for any water sport equipment. Launching is made easy with a hydraulic system that quickly raises and lowers your leisure equipment. Harmonious: The stylish Gran Turismo 50 epitomises harmony. The furniture is skilfully crafted by the Beneteau cabinetmaking workshop and features a matt walnut wood finish and soft-touch leatherette upholstery. 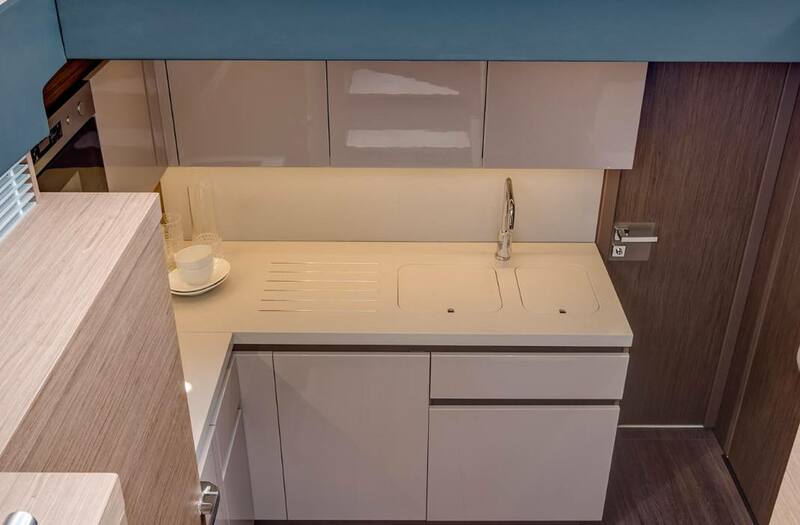 The flagship of the Gran Turismo range plays with a combination of materials and finishes, including textured bedheads and Corian® kitchen worktops, achieving an outstanding level of comfort.